Bought shamrock? Is it the real thing? 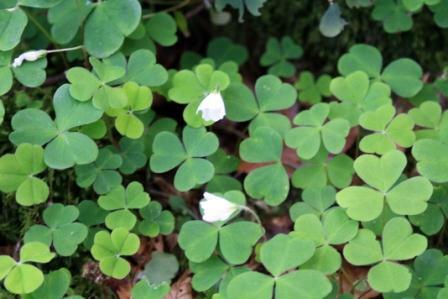 As children we often gathered more clover than shamrock to wear in the run up to St Patricks Day as it’s almost impossible to tell the difference. And to be honest nobody seemed to care very much back then anyway, you simply washed the mud off the roots and pinned a bunch to your hat or lapel with a safety pin and off you went. Nowadays you can buy handy packets of commercially grown fresh shamrock at supermarket checkouts. But is it the real thing? Seedsavers, an organisation set up 14 years ago in Ireland, to save the seed of indigenous varieties of apples and potatoes before they became extinct reckon they have ‘real’ shamrock. Thanks to the benevolence of an American who sent them the seed of an old shamrock plant that had been smuggled from Ireland some 99 years previously. It was replanted, harvested and is now happily and (safely for generations to come) growing like a weed at their headquarters in Mountshannon. And what about the shamrock that is presented to The Whitehouse on behalf of the people of Ireland? Who grows that and where does the seed come from? Is it the real thing? Peter Martin of Living Shamrock.com assures me that it is, the seed having been verified by botanists in UCD. He explained to me how it is grown roots and all, in a specially patented (soil and water free) gel substance to keep it fresh for longer and handier to export. Which means that it arrives ‘live’ and ready to wear on St Patricks Day at Irish Embassies, Army Camps and other special Irish parades and events all around the world. So herself (the first lady) can simply pop her shamrock into the ground afterwards and let its Irish roots dig happily into American soil. Beannachti na Feile Padraig by Susan Byron. For information about St Patricks Day visit www.irelands-hidden-gems.com/st-patricks.html where you can also download a free iPhone app about St Patricks Day and all the events that are happening in Ireland.